If you’re going to be in the Baltimore area between July 17th and September 8th, you may want to stop by at Geppi’s Entertainment Museum to see a unique exhibit featuring the largest collection of original Carl Barks artwork ever assembled! A significant percentage of the artist’s 125 oil paintings will be on display, along with preliminaries, studies, statues and comic book pages. The Carl Barks Retrospective will also host a sale of Barks originals, lithographs, statues and other items by Diamond International Galleries during this period. Check out this great 12-minute documentary about Carl Barks which I found on the Geppi Entertainment Museum website. It’s a very nice video in two parts about Barks’ career. The video ends with Barks’ 95th birthday held at a gallery of his oil paintings. 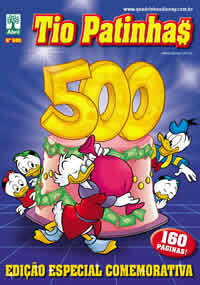 This month marks the anniversary of Brazilian monthly magazine Tio Patinhas (‘Uncle Scrooge’), as publisher Editora Abril publishes the popular series’ 500th issue. 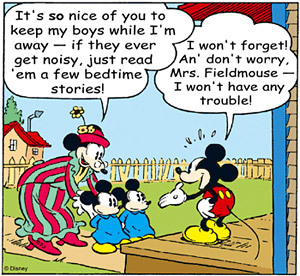 The commemorative issue of Tio Patinhas will feature stories by several classic Disney masters, including Carl Barks, Tony Strobl, Marco Rota, William van Horn and Don Rosa.